Boasting the world’s largest religious complex, the famed Angkor Wat temples, Cambodia offers the adventurous family the perfect blend of rich culture, mountains, jungle and tropical palm-fringed beaches. Flanked by Thailand, Laos and Vietnam, Cambodia has much in common with some of its neighbours – they collectively formed the mighty Khmer empire in centuries past – but is less developed and far less visited. Despite its troubled past, or perhaps because of it, modern-day Cambodia embraces travellers (children in particular!) with open arms; the warmth and infectious enthusiasm of its people every bit as compelling as its landscapes, heritage and cuisine. From staying with a local family or cycling paddy fields to catching sunset from the eighth wonder of the world, we’ve whittled down the many unique experiences on offer to our Cambodia with kids Top 10. Enjoy! Any Cambodia with kids trip HAS to include the largest religious temple complex on the planet. Be warned though, the site is huge. Whilst you can easily visit the main temples of Angkor Wat, Bayon and Angkor Thom by foot, we find that families of every age much prefer cycling, thereby being able to explore the outer lying ruins more easily and avoid the ‘are we there, yet?’ pleas. Sunset at Angkor Wat can be a very touristy (a.k.a. busy) affair so you’ll get a much better view from atop one of the less-visited ruins – and a view to yourselves too. 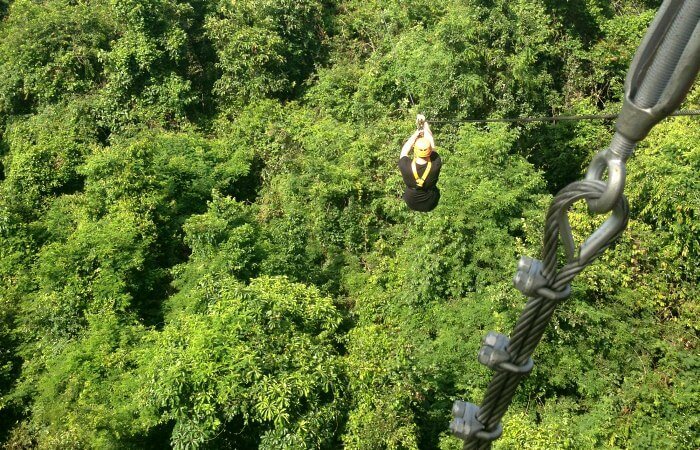 Near to Angkor Wat (but not invasively so) is a zip-line eco park, where you and your kids can soar through the forest canopy in a safe yet thrilling way, enjoying amazing jungle views as you do. So. Much. Fun. Less visited and touristy than Siem Reap yet Cambodia’s second-largest city, Battambang is known for its French architecture and cosmopolitan feel. It also boasts an even more famous attraction that anyone travelling through Cambodia with kids should visit: the bamboo train. Affectionately known as ‘Norrie’, the bamboo train is essentially a bamboo platform that balances over two sets of wheels and is powered by a motorbike engine. It was once used to great effect in the days following the overthrow of the Khmer Rouge and proved a lifeline to villages needing to transport goods across the country. Today, with the roads much improved, the Norrie has become more of a tourist attraction, albeit a kooky one. Just off the coast of Sihanoukville are the paradise isles of Koh Rong and Koh Rong Samloen, where you can stay in Robinson-Crusoe-style beach huts (or, if you prefer, a more upmarket resort). Pleasures here are of the simple kind but you and your family will love the laid-back nature of the white-sanded and palm fringed isles. Its a great place to swim in the turquoise waters and far from the construction sites plaguing mainland coastal Cambodia. In an action-packed holiday in Cambodia with the kids, there aren’t that many opportunities to get out and explore the countryside. However one exception is a gorgeous eco lodge in the Cardamom mountains, in the south west of the country bordering Thailand. Here you can really get out to explore virgin forest either by quiet trails, spotting wildlife, monkeys and tropical birds and butterflies, by kayak or by taking a sunset boat ride. We take you through the jungle to a waterfall where you and your family can swim in the pool at the base of the waterfall – sheer bliss! There’s no better way to understand local culture than by spending a night with a local family, although very few tourists actually do it. Away from the hustle and bustle of Siem Reap, you’ll enjoy a much slower pace of life, not just eating with the family and sleeping in their stilted hut but wandering around the village, meeting the locals and exploring the surrounding countryside. It’s a surprise to many that Khmer cuisine is so delicious: think coconut milk soups and fish-wrapped in banana leaves rather than noodle soups or stir fries. It’s an authentic Cambodia with kids experience that will inspire your mid-week meals once back home. The Cambodian Circus, a social enterprise located in Siem Reap, with its nonprofit school, Phare Ponleu Selpak, based in Battambang, has transformed the lives of hundreds of local children. It is a success story just as much as a fascinating, engaging and entertaining day or night out. You can watch the school run circus skills and dance classes throughout the day before taking in a real performance during the evening. Do read more about what’s been quoted as, ‘The best experience in Cambodia’. It’s an aspect of Cambodia that for obvious reasons, some parents would rather their kids weren’t exposed to. However, to understand modern-day Cambodia properly is to explore not just its ancient history (Angkor Wat) but its most chilling chapter, the Khmer Rouge regime. Tuol Sleng was once a high school but between the years of 1975 and 1979, became a torture centre for the Khmer Rouge. Now a genocide museum, the display here is less graphic than a visit to the Killing Fields at Choeung Ek. That being said, it’s definitely only suitable for older children, i.e. teens. Want to find out more about this fascinating country? Visit our Cambodia family holidays page, e-mail us via our contact page or call us on 01728 751752. If you enjoyed our Cambodia with Kids Top 10 blog, please share it on social media. Thank you!